FrSKY receivers provide a simple and inexpensive solution for those fliers wishing to enjoy the significant benefits and advantages of interference free 2.4GHz operation. 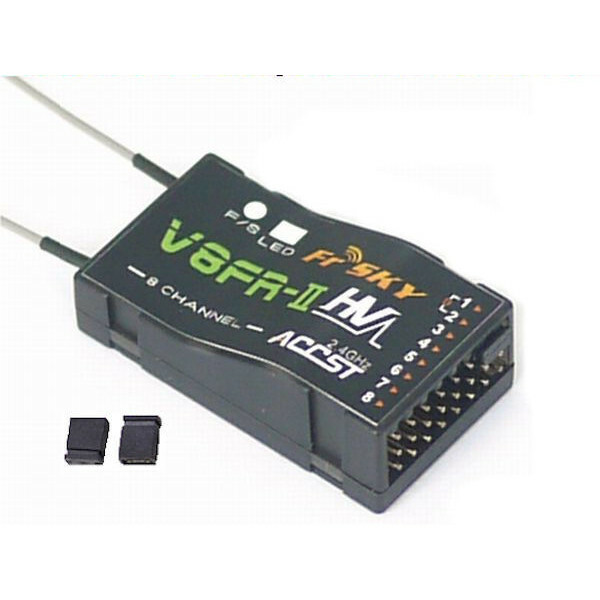 This FrSKY ACCST 2.4GHz receiver is one of a range of receivers designed and developed by FrSKY to be compatible with all FrSKY ACCST 'V' series and 'D' series transmitter modules including the: V8FT, V8JT, V8HT, DFT, DJT, DHT and DHT-U. The V8FRII-HV is smaller and more compact than its predecessors. It can handle an extended voltage range of 3V-16V. Higher voltages are useful in removing the problem of 'brown-outs' (inadequate voltage causing intermittent interruption of receiver operation). This occurs when small capacity receiver batteries are used and the aircraft has micro or digital servos. The output voltage of this receiver is NOT regulated. If you plan to use a higher voltage battery pack, you must ensure that any connected servos are able to handle the input voltage, otherwise you run the risk of burning them out. Two 'jumpers' are supplied with this receiver. They are used to connect the channel 1 and 2 signal pins temporarily when binding the receiver to FrSKY 'D' series modules when using telemetry. They are not needed if binding to 'V8' series modules or if using a 'D' series module in 'V8' i.e. non-telemetry mode. * FrSKY’s Advanced Continuous Channel Shifting Technology (ACCST) system giving a highly reliable link, especially in high interference environments. 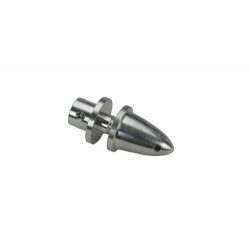 * Easy to bind and has instant link-up between transmitter and receiver. * Error-free link, by using 48bits CRC algorithm. * All channels offer failsafe. * Very smooth servo movement. When binding this Receiver to the XJT Module the dip switches must be set to 1-ON / 2-OFF the Receiver must have the jumper pin bridging the signal on channels 1 and 2. Remove the jumper pin after binding. Prop Adapter to suit 3mm Motor Shaft Grub ScrewAlloy Prop adapter, the motor shaft is held in place ..
Frsky DHT - DIY Telemetry ModuleThe DHT Transmitter Module is a great option for radios that can not..